Prepare to be inspired, amused, moved, and thoroughly entertained when Caren Armstrong brings to the Freight stage her long-running series Celebrating Songwriters. Tonight's show features the award–winning, performing songwriters Teresa Tudury, Houston & Jones (aka Travis Jones and Glenn Houston), as well as the energetic, emotive talents of Caren herself. Artists are featured individually in the first set, and then play in the round, Nashville style for the second set. Audience members have particularly enjoyed the spontaneous collaboration that often arises from these rounds. The old adage, "Arm yourself with impeccable technique and throw yourself on the mercy of inspiration" defines the work of singer-songwriter Caren Armstrong. 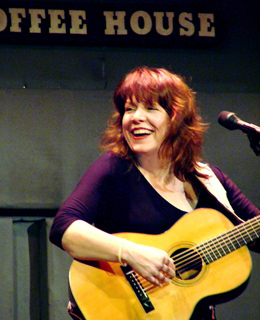 Brimming with award-winning songs, Caren's performances spotlight her skillful guitar playing, quick wit, and honest style. Count on Caren to deliver dangerously honest, wickedly funny, and disarmingly vulnerable music that references folk, country, blues, jazz, and popular music, leaving no emotional stone unturned along the way. “Part chanteuse, part comedian, part bona fide pop artist, Teresa takes you on a musical journey of wild and powerful songs and stories from the depths of her incredibly rich and inspiring repertoire. Says the L.A. Weekly, "Picture a cross between Bette Midler and Bonnie Raitt musically, and toss in the most side-splitting stage patter imaginable, and you have Ms. Tudury. This musical comedian is totally engrossing." Travis and Glenn, the heart and soul of the wildly popular Houston Jones Band, hit the Freight stage in a rare duo performance. Travis' distinctive, smoky vocals and unrelenting rhythm guitar chopscombine with Glenn's sizzling, virtuoso, upside down and backwards guitar playing to create an eclectic/electric mixture of grassroots Americana music. Travis' musical background and history reads like a William Faulkner novel. He began singing gospel music at age four with his mother Lottie Mae Adams, a blues singer who recorded several discs on Paula Records. During his time in California, he has recorded with various artists, as well as releasing two self-titled albums – Lost Highway, The Legendary Music of Hank Williams and Dance All Night – along with five CD releases with Houston Jones. Glenn has received the “Best Guitarist” award for 2009 from the Northern California Bluegrass Society. In recent years, he has performed live and in the recording studio with Grammy Award winner Ramblin' Jack Elliott; he co-founded and played lead guitar for the critically acclaimed acoustic group The Waybacks; he has performed with blues legends Mark Naftalin and Nick Gravenites; and he has earned a second nomination for "Best Lead Guitar" from the CCMA.